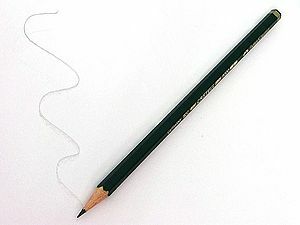 A pencil is an instrument for writing and drawing on paper. It consists of an interior strip of solid material that produces marks used to write and draw. The marking material is most commonly graphite. Pencil lines have the special property that they can be erased easily and almost without a trace (if they haven't been drawn with too much pressure), using an eraser or "rubber". For colored pencils, see crayon. The American system, using numbers only, developed simultaneously with the following approximate equivalents to the European system. Pencil drawing by Richard Hegemann, 1932. Pencil drawings on paper are most likely the majority of all drawings today, because of the good erasability of pencil lines, and the inexpensiveness of both pencils and paper. In former centuries, artists such as Leonardo da Vinci would draw with other instruments such as charcoal or ink, and paper was not commonly used for writing and drawing until the 14th century when it gradually replaced parchment. This page uses content from Wikipedia. The original article was at Pencil. The list of authors can be seen in the page history. As with Spanking Art, the text of Wikipedia is available under a copyleft license, the Creative Commons Attribution Sharealike license. This page was last edited on 29 February 2008, at 18:19.